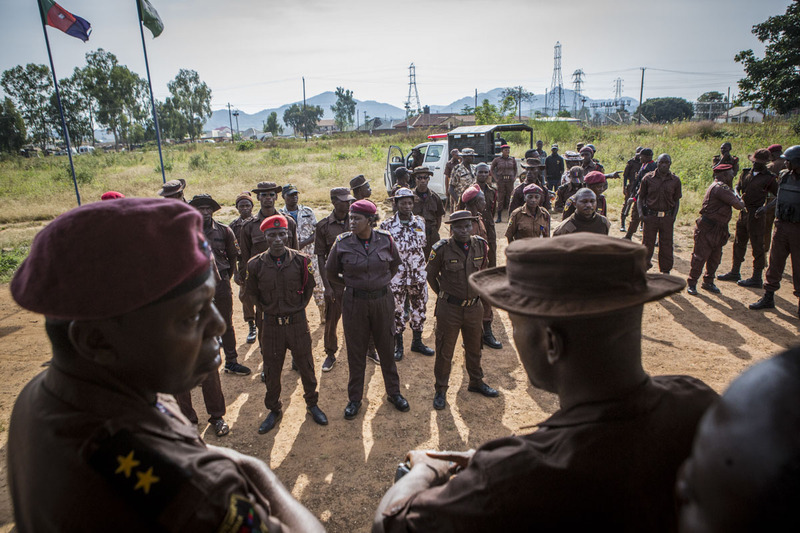 Barkin Ladi, Jos, Nigeria- Members of the Vigilante Group of Nigeria, Barkin Ladi Division, stand at attention before leaving their base for patrols and checkpoint duties in Barkin Ladi, Nigeria on Monday, October 22, 2018. Growing animosity between ethnic groups coupled with a lack of security has fomented an increase in violence in recent years. Despite the divisive chaos engulfing the Middle Belt of Nigeria, a group of multi-ethnic men and women, part of the Vigilante Group of Nigeria, are providing much needed security and trust to all groups affected by the conflict.